Poetry Friday is with Buffy today. Thus began our late night discussion of her poem. This is what poetry should be, a walk in the woods that leads to talk that then becomes a poem. Jane Hirshfield writes in her poem, Mathematics, “Does a poem enlarge the world/ or only our idea of the world?” I believe that poetry and your own expression of it does enlarge the world. We experience the experience in a new and loving way. Please go to Dani’s blog and read her poem, her first brave contribution to Poetry Friday. Our discussion of summer made me think about how summer reveals itself differently in different parts of the world. For Dani, it’s in the lilacs. Here in South Louisiana, the landscape is different. My poem attempts to capture my own summer landscape. I love the connection I feel to your poem, Margaret. Your rope reference of course reminds me of the rope swing we had in our maple tree! And your flower image looks like the beauties I shared with you from my recent hike-is it the same one? THANK YOU for mentoring me into the world of poetry my friend! I am so delighted that Dani, joined our community of writers. When I saw her name on the list, I smiled. I will make my way round the PF group to read your post Dani. Margaret your sunshine-colored flower reminds me of the sunshine you bring to life. Your poem speaks of summer like a gentle around the corner. Save this poem because I will ask you for it when the end of June rolls around. Yes, summer vibrates here, too, but not for another month or so. Right now, my summer is a tiny caterpillar, growing towards butterfly wings! We have about 6 months of summer down south. I will not be so happy when the temps are still high in October. Where did I recently read that poetry is all about the verbs? You prove that point here. You won’t hear me singing praise in August. 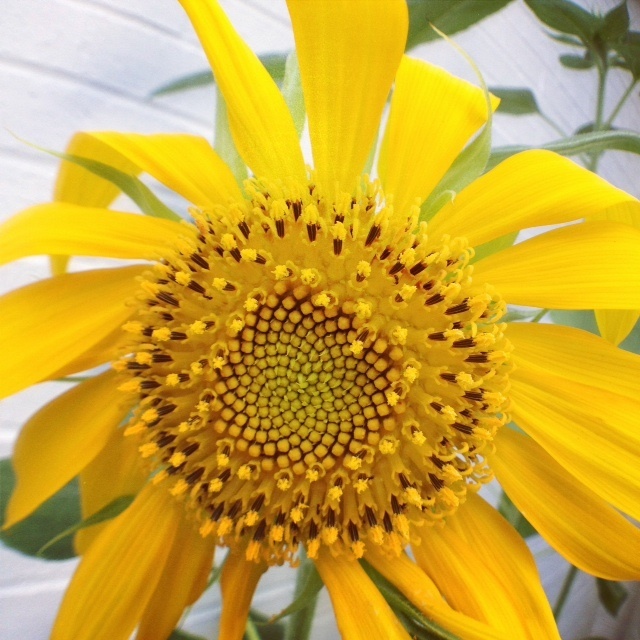 I love your sunflower picture that clearly shows the Fibonacci sequence. And I’m delighted you have someone to talk poetry with, it isn’t everyone who is willing or even wants to talk poetry, which is why I love Poetry Friday. Thank you for this post. Yes, summer is very different in my part of paradise, we have summer all year long. Oh, my gosh you had me at “rope swing”. What a great poem. I want to copy it! I’m so jealous of you. I’m now down to 9 days of school left and ….oh, the tiredness and busyness interfere with writing so much. I’ll get there though….nine days ago doesn’t feel like that long. Welcome to Poetry Friday, Dani! I’m a huge benefactor of all the poetry learning and sharing and support I’ve had from Poetry Fridays. I will head on over to your blog. I love the summery things you’ve included, Margaret. And I just came from Dani’s poem. Her summer poem is lovely too. I’m glad June is here, and I wrote about it, too. Love and summer are definitely in the air. You and Dani are making me nostalgic. I have this poem here: https://friendlyfairytales.com/2016/06/23/lupine-spires/ It says late June to me. I can’t wait! Your summer lupine poem is a magical dance. Lovely and expectant. Thanks for adding the link here. Can’t wait for that moment, myself. Still 3 weeks of school to go. What an inviting summer poem Margaret, thank you for opening summers arms for us to embrace! The first stanza had me captured immediately! Beautiful sunflower, they are magical. Margaret, poem, prose and photo are wonderful! My favorite line: “This is what poetry should be, a walk in the woods that leads to talk that then becomes a poem. ” How wonderful that you and your friend Dani could collaborate. I’m looking forward to reading her poem. Thanks so much for sharing yours as well–I love the structure and each stanza offers its own bit of magic. Lovely! Summer? I’m still waiting for spring. But maybe we’ll have a less-hot summer this year. I enjoyed your tribute to summer–the sunflowers et al. definitely outweigh the negatives. Thanks for sharing your beautiful summer landscape, Margaret. I love how the sunflower that opens the morning returns later as the sun that lingers in the sky at the end of the day. Happy summer! Ah, I am anxiously awaiting more flowers. I also greet them with some sadness, as they are over toooooo soon here! I love your look at a sunflower and how “summer lingers” in your part of the world. On my way to welcome Dani! The rope swing is just beautiful. Gorgeous poem Margaret! 2 1/2 weeks left and then I can climb onto that rope swing to celebrate summer. Love this poem, Margaret. You nailed that summer feeling! Savor it with a glass of lemonade or ice tea. After reading both Dani’s and your poems, I am ready to welcome summer! We welcomed lilacs earlier in the spring, and I’m looking forward to seeing the sunflowers we planted bloom later. Oh, I can’t wait for those lazy, hazy, crazy days of summer!